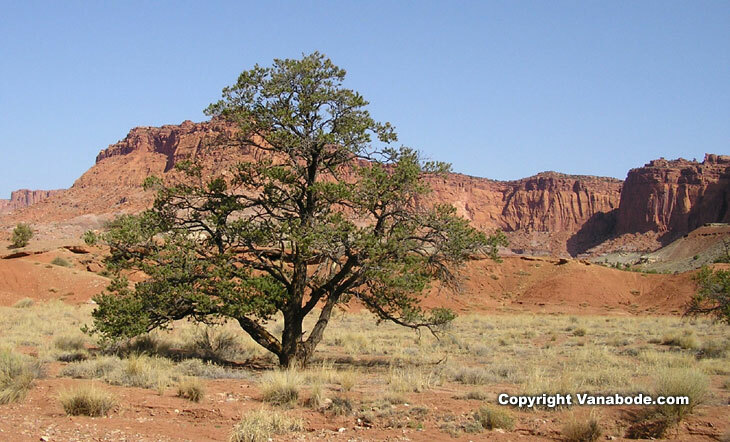 Capitol Reef National Park, 2-5 May days - see Park Visitor Center for free maps and information. Brilliant array of colored cliffs, canyons, arches, and domes. The Waterpocket Fold is a 100-mile long wrinkle in the earth's crust. The park's paved scenic drive is 25 miles round-trip and overlooks slickrock wilderness, arches, and canyons. Around the campground and throughout the park you can pick and eat the fruit grown in the orchards free of charge. If there is a non-hiker/explorer in your group no worries. Drop them off at the park on the river just before the campground. There are restrooms, big shade trees, picnic tables, a foot bridge, and a lot of grass to play Frisbee or football without getting in anybody's way. Or you can do what we did, take a sheet, lay it on the grass and take a nap or run around with the rabbit while he eats grass and naps. Have fun and relax here this is certainly a majestic and never forgotten place. Easy to get to and easy to enjoy as long as you watch the temperatures for the time you plan on coming. Capitol Reef National Park is a small national park but has a brilliant array of colored cliffs, canyons, arches, and domes. The park has historic orchards, an old schoolhouse, and other pioneer structures. 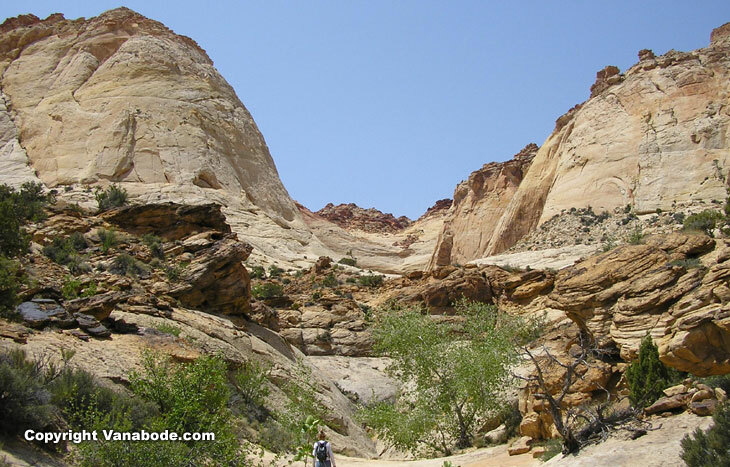 The main feature at Capitol Reef National Park is the Waterpocket Fold. This is a 100-mile long wrinkle in the earth's crust. These wrinkles contain innumerable eroded pockets that hold thousands of gallons of rainwater. And this water has affected the history within the park. In the 1880's settlers established the community of Fruita and grew orchards of apple, peach, cheery, pear and apricots. While visiting the park you can pick and eat the fruit grown in the orchards free of charge, but you pay a fee if you want to take the fruit with you. Anytime I can go off road I'm game. It's not like I go 4x4'n but I do like to get past the crowds and out into the wilderness. At the end of the scenic drive the paved road ends and if you stay to the left you begin driving through some beautiful narrow, winding, barely wide enough slot canyons until the road ends at a parking area. From there you hike to The Tanks or on the Golden Throne Trail. This parking area was full of vehicles but we passed about six people on the trail to The Tanks. 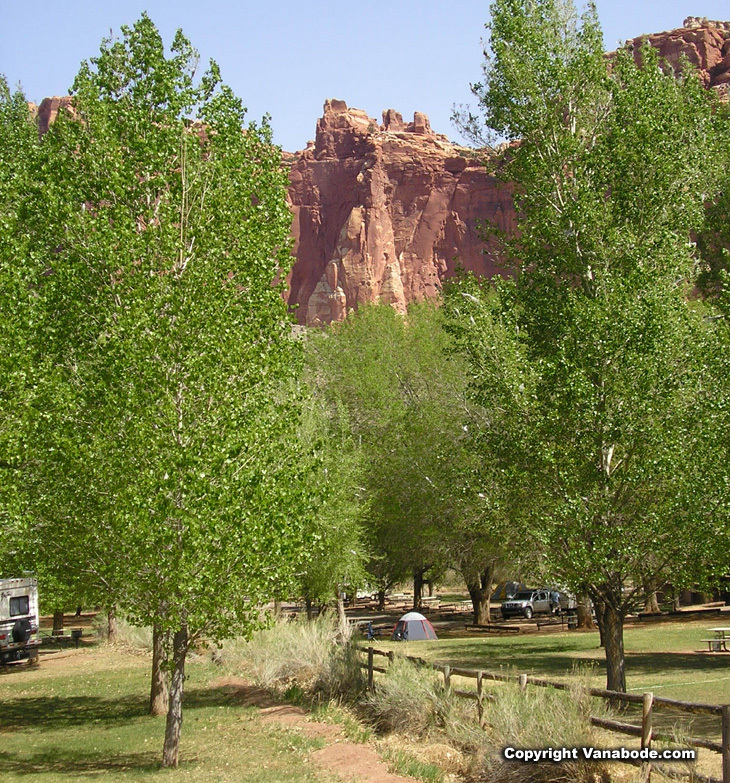 Above: Picture of Fruita Campground in Capitol Reef. Where did all this lush green color come from? Well, from the Fremont River that runs adjacent to the campground and there are historic orchards surrounding the grounds. 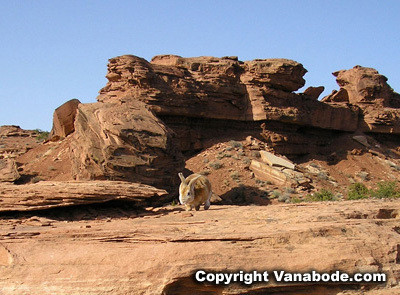 The park's paved scenic drive is 25 miles round-trip and overlooks slickrock wilderness, arches, and canyons. The scenic drive of Capitol Reef is only a small fraction of park. There are a couple of unpaved roads accessible from within Capitol Reef National Park, and cars do quite well because the roads are managed by the park. To get within the majority of the park boundaries you have to travel the more rugged routes that cross the northern and southern sections of the park. For these unpaved roads a high clearance 4-wheel-drive vehicle is highly recommended. 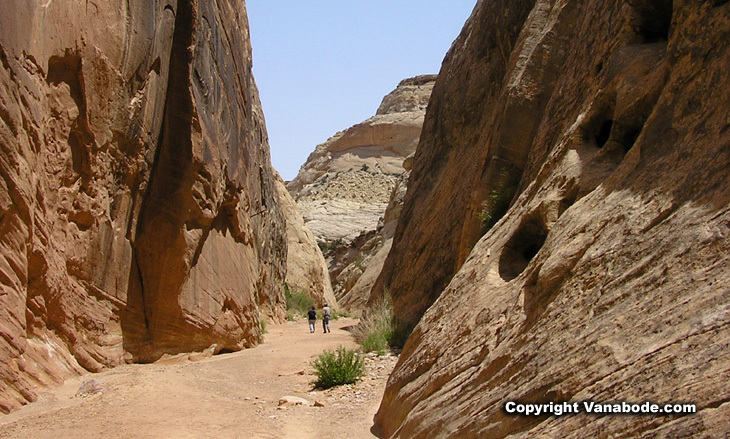 Above: Picture of hikers traveling through Capitol Gorge going to the Tanks. The trail is flat until you wander off it where a little boulder climbing is involved. If there is a non-hiker/explorer in your group no worries. Drop them off at the park on the river just before the campground. There are restrooms, big shade trees, picnic tables, a foot bridge, and a lot of grass to play Frisbee or football without getting in anybody's way. Or you can do what we did, take a sheet, lay it on the grass and take a nap or run around with the rabbit while he eats grass and naps. Above: Picture of the Tanks. 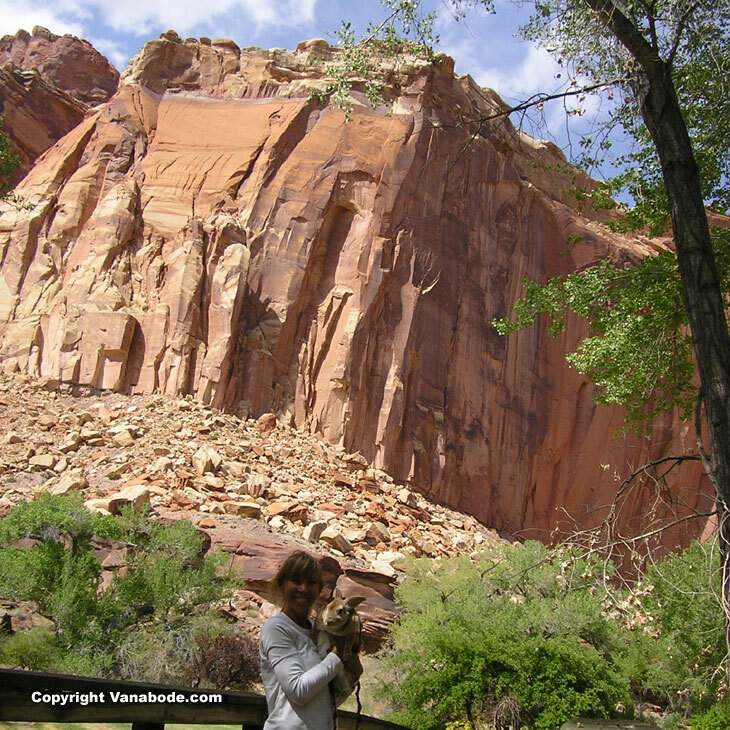 At the end of Capitol Reef Scenic Drive, park, walk through the Gorge to the end and start climbing. You will come to the tanks, named for holes and pockets in the rock formations that hold water. Capitol Reef's campground and two primitive backcountry campgrounds are open year round. The Fruita Campground has a dump station but no hookups. There are no food services and no gas stations within the park. Above: Picture of Chimney Rock which is directly across from Panoramic Point. At Chimney Rock take the difficult hour long trail through all of the spectacular red rock formations. Jason's thoughts - Gorgeous grounds and camping upon entrance to the park. You could hang out here all day if you wanted enjoying huge shade trees, breezy views of the surrounding vistas. The free movie that plays at the visitors center is enlightening and worth seeing. The road in is an absolute must if you are within three hours of this place. It is just that good and you don't have to get out of your car. 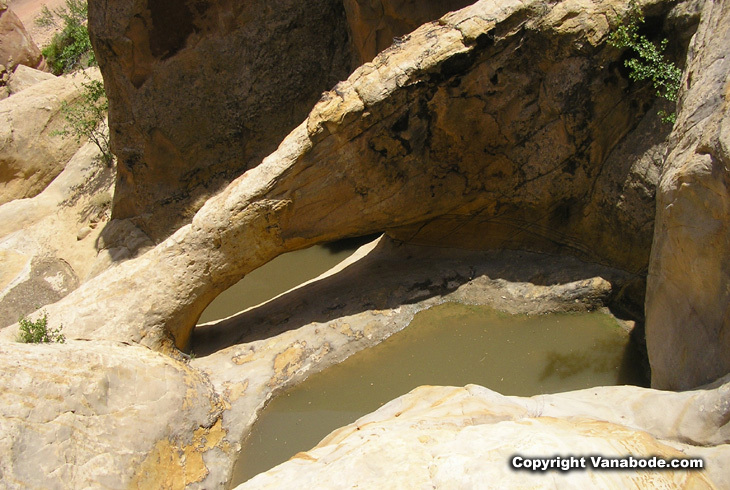 We drove then hiked the Capitol Gorge portion to The Tanks and this part is especially tight, winding, and adventurous. I really liked this portion even more than anything I saw in Death Valley. Kelly's thoughts - A terrific scenic drive but to really see past the canyon walls around you then get out and hike. The views are beautiful with the farmlands of Fruita in the distance, and the mature orchards against the red-colored rocks was fascinating due to the fact that Capitol Reef National Park is in a dry climate. Both Bugsy and I took advantage of being lazy at the grassy park by the Fremont River. Travel info - BIG motorhomes or trailers - If you are going to take the capitol gorge scenic drive you need to stop at the turn around/parking area before the road turns into dirt. There it becomes so narrow that two cars can barely fit to pass, winding between the very steep canyon walls. Capitol Reef is 112 miles east of Bryce Canyon and 270 miles southwest of Arches National Park. 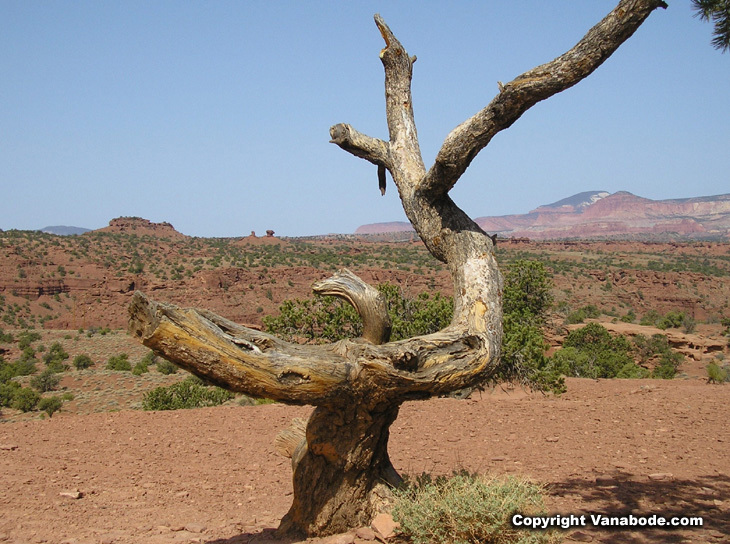 Visit The Tanks at Capitol Reef National Park.